How to Determine the Type of Leather You Have & What to Use On It. Once you buy a piece of leather furniture, you have to keep it clean. We recommend Leather Magic products for cleaning and maintaining your leather furniture (you can buy it right here on The Stated Home). Leather Magic has different formulas that are specifically designed to work with various types of leather. All leather is not created equal, so it’s really important to identify the type of leather you have before using any cleaning, maintenance or repair products. The use of an improper product may cause irreparable damage. So what type of leather do you have and what products do you need to maintain it? Unfortunately, it’s often difficult to tell based on appearance or even the product’s description. That’s why the folks at Leather Magic have developed an easy test to identify which product line to use. Protected Leather is made with a top coating that seals the leather and helps to reduce the absorption of dirt, liquids and oils. 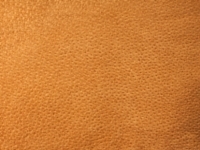 This type of leather has a smooth, grained finish, although the degree of graining may vary. The finish may be either matte or have a sheen. Test: Place a small drop of water onto the surface of the leather. The drop of water should bead up and remain on the surface of the leather. Unsealed Leather can be a challenge to maintain, as there is no protective coating. (Please note that some retailers—not The Stated Home—will apply a “Scotch Guard™” type product, which can protect the surface for a short time.) The smooth, grained appearance is similar to that of Protected Leather. Test: Place a small drop of water onto the surface of the leather. The drop of water should sit on the surface for a short time and then soak into the leather, leaving a dark area where it has been absorbed. “Semi-Aniline” Leather Care Kit (includes NuBuck Leather Cleaner, NuBuck Leather Conditioner, Ink & Stain Remover, cleaning sponge and applicator sponge). There is no protective coating on Nubuck Leather, so exposure to liquids, oils and dirt may create stains. (Please note that some retailers—not The Stated Home—will apply a Scotch Guard™ type product, which can protect the surface for a short time.) These leathers have a napped, “brushed” finish (suede falls under this category). Test: Rub the hand over the surface of the leather in a left/right motion. Due to the nap of the leather, the surface color will lighten when brushed in one direction and darken when brushed in the reverse direction. Pull-Up Leather has a waxy topcoat, giving it a two-toned or antiqued look. 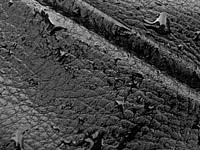 Commonly referred to as “distressed leather,” it scratches easily (although the scratches are often absorbed back into the leather, softening over time). 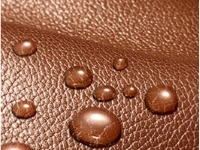 Test: When a drop of water is placed on the surface of this leather, the drop will initially bead up on the surface. If left alone for several minutes, the droplet may begin to be absorbed into the leather and cause a darkening of the area. However, this result may not always occur, due to differences in manufacturing techniques. To confirm the results of the water drop test, an alternative method is to lightly scrape a fingernail over a small area. A scratch (much lighter in color) will appear. This scratch may be easily removed by using a leather conditioner designed for Protected Leather to replace the wax/oils that have been disturbed. The Stated Home does not sell any pieces made with Bicast Leather, but we still wanted to mention it. 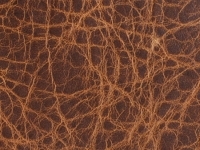 Bicast Leather resembles Protected Leather in appearance, but is made by mixing finely shredded leather scraps with an adhesive to form large sheets of a leather-like material. It has a top coating, usually silicone, that colors, “seals” and hides the underlying material. The finish usually has a semi-gloss to glossy sheen. Bicast Leather will have a much stiffer, harder feel and will not bend or fold as easily as true leather. 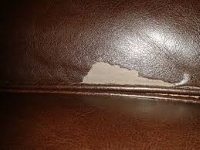 Peeling and flaking of the finish of Bicast Leather is extremely common. If you cannot identify your leather using the tests described above, please contact the helpful folks at Leather Magic!™.